Today is the last day of Presidents’ Day Weekend and many of you have visited our ski resorts enjoying one of the most popular ski weekends of the year. Mother Nature has cooperated with Elk Mountain and Montage Mountain to provide great conditions. While this popular recreational winter sport is fun and a nice diversion from what can otherwise be a long cold season, it is not without its risk for injury. The most common injury of the upper extremity that skiers experience is known as ‘Skier’s Thumb’. This condition refers to an injury to a ligament (the Ulnar Collateral Ligament or UCL) that connects two bones of your thumb together. Typically, the injury occurs when the thumb is moved forcefully away from the palm, causing the ligament to tear. This occurs commonly when a skier falls while holding ski poles. This injury, while common in skiers, does occur in other sporting activities such as football, basketball, and soccer. Sports that require the use of sticks, such as hockey or lacrosse may also predispose athletes to a ligament injury with the forceful movement of the thumb in an outward direction. It can also be the result of a chronic injury from repetitive stress on the thumb. Thumb pain: Particularly on the inside part of the thumb. Thumb pain and giving way with otherwise simple tasks, such as holding a glass. Thumb may look deviated or out of joint. The Ulnar Collateral Ligament (UCL) stabilizes the thumb joint where the thumb connects to the hand. It is necessary for this ligament to be stable because it makes an important contribution to grasping movements of the thumb. If you have injured this ligament it may be managed conservatively with immobilization. In more severe cases if the ligament has been completely torn, surgery mat be required to repair the ligament. Physical exam: would demonstrate swelling, tenderness at the area of ligament insertion, instability and pain with movement. Non-surgical (conservative): Conservative treatment involves immobilizing the thumb in a neutral position to allow the ligament to heal in either a cast or splint. Surgical treatment: Surgery would be indicated for a complete tear and/or joint instability. This would consist of outpatient surgery, where you would go home the same day. The surgery can be done with either a general anesthetic (the patient sleeps throughout the procedure with breathing assistance) or a regional block (the patient could either be awake or asleep while breathing without assistance).Post-operative care would include a cast for two weeks, at which point the sutures would be removed and a removable splint applied. The ligament would take approximately six weeks to heal. Rehabilitation: If you have a strained ligament and do not require surgery you may be referred to a hand therapist for the fabrication of an orthosis or splint which will be worn for 4-6 weeks. The purpose of the splint is for protection from further injury and to position the thumb appropriately to allow for optimal healing. If there is a complete tear and surgical intervention is necessary you may be placed in a cast for 2 weeks followed by a splint for an additional 4 weeks. You should avoid activities that may cause re-injury for another 4-6 weeks. Following the removal of the cast the thumb will be stiff and weak. A supervised exercise program is important to regain thumb range-of-motion. Once sufficient range of motion is restored, strengthening exercise will be initiated to regain maximal thumb strength and function. When necessary, a smaller splint can be made to allow earlier return to activity. It is comforting to know that there are options available if you experience an injury or have compromised thumb stability from a long standing problem. Our thumbs are an integral part of our hand function and a stable thumb is essential for allowing us to participate in all aspects of our daily lives.New improvements have been made in breakaway ski pole straps that help prevent this injury. These devices can be found at local ski shops located by Elk Mountain and Sno Mountain. 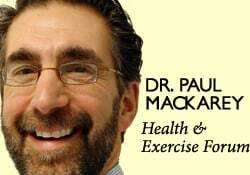 NEXT MONDAY – Read Dr. Paul J. Mackarey “Health & Exercise Forum” in the Scranton Times-Tribune. This article is not intended as a substitute for medical treatment. If you have questions related to your medical condition, please contact your family physician. For further inquires related to this topic email: drpmackarey@msn.com. Paul J. Mackarey PT, DHSc, OCS is a Doctor in Health Sciences specializing in orthopaedic and sports physical therapy. Dr. Mackarey is in private practice and is an associate professor of clinical medicine at The Commonwealth Medical College. Casey Burke, DO, is an orthopedic surgeon specializing in hand surgery in the greater Scranton area.